It’s quite likely that everyone with an operable camera or smartphone has a picture of a moose taken somewhere around Sandpoint. But when a moose moves in on a semi-permanent basis, the photo opportunities are endless. And if you happen to be a professional photographer … well, then, you might come up with something along the lines of an advertising campaign—much like Annie Pflueger did. It doesn’t matter who gets there first, it’s generally wise to always allow a moose the right-of-way. Just ask Carla Pennington Kirby. “A few years ago I was skiing Schweitzer, on Snow Ghost, and I was three-quarters of the way down the slope when I heard the oddest sound of horses galloping in my helmet. I shook it off and continued to ski toward a dense thicket of trees, when to my surprise a large moose came running at full speed, out of the trees, directly at me,” she said. 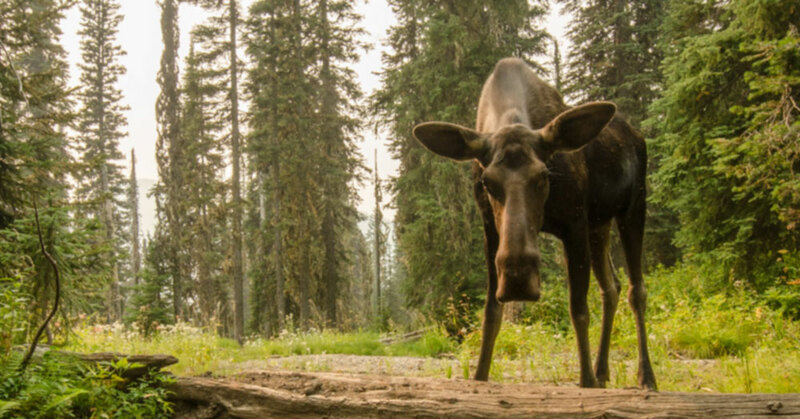 Moose and water go together like… ham and eggs? Donny and Marie? Beer and baseball? You get the point. 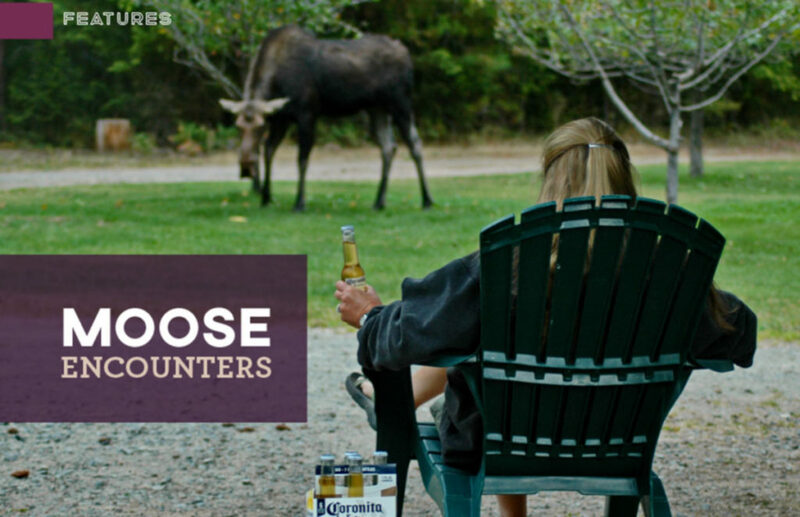 And if you have water on your property … or near it … you’ll get the moose, too. 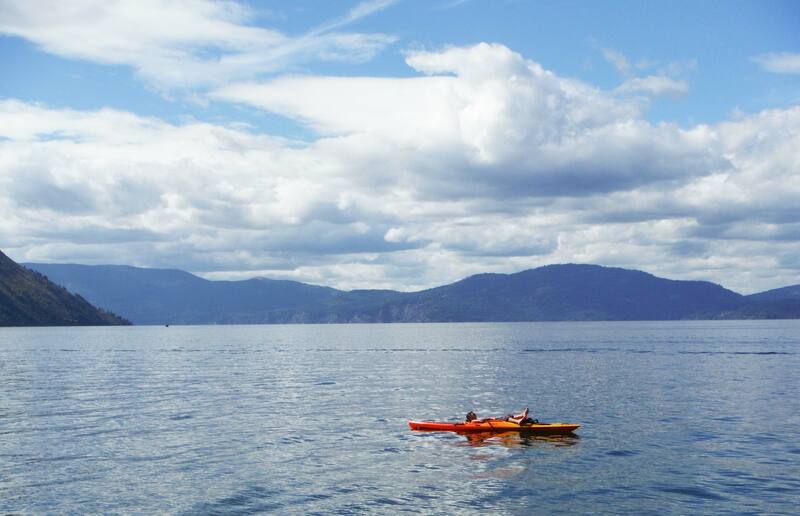 Moose like water, and humans don’t deter them from enjoying it. 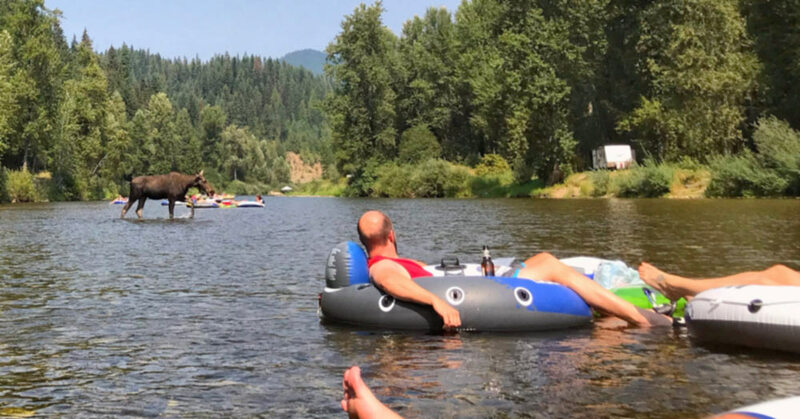 They’ve been spotted frolicking in pools, playing in sprinklers and, as in this photo, making their way through an afternoon river float. 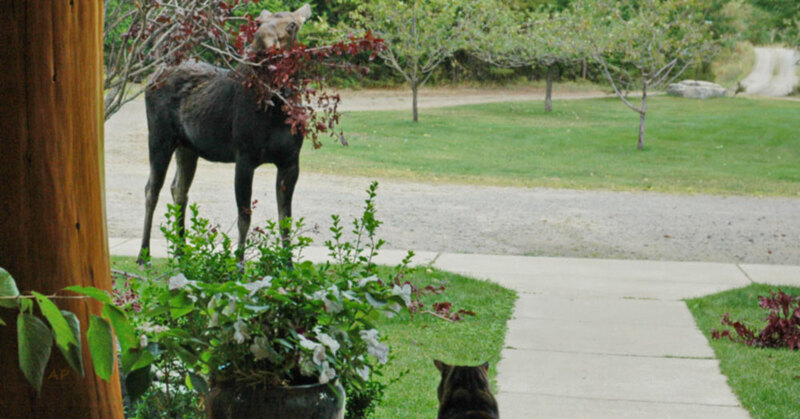 Moose love a garden anywhere, but they’ve obviously learned that the pickings are extra special on the south side of town, and head there for an all-you-can-eat buffet. In the 1980s and ‘90s, when the Idaho Club golf resort on Highway 200 was still called Hidden Lakes, its tagline was “Where the moose are loose.” The course lies on the lower Pack River, where moose are plentiful, and they made (and make today) frequent appearances on the course itself. Ron Perron was working at the course and tells of a time when he and his wife, Mary, were golfing. “I was on the 9th hole and putting for a birdie,” he said, “when Mary began fiercely whispering my name.” It was an important putt, and if you golf, you will understand that Ron was a little annoyed at the interruption. “What? !” he said in response, and she warned him to back slowly off the green. “A momma and two babies were walking up beside me,” he said. 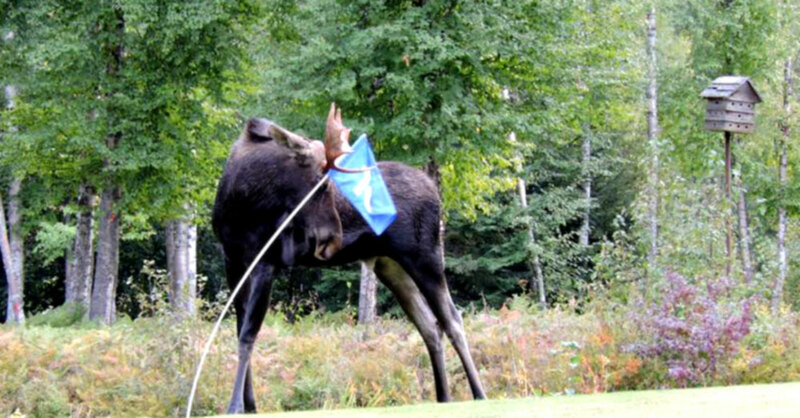 “I backed off very slow.” Is there a benefit to golfing with moose? “I gave myself a birdie for the hole,” Ron said. Automatic birdies were also given to golfers when a cow moose decided one day to give birth on the fairway near the 7th hole. Others at the course remember, with fondness and quite a lot of laughter, another encounter between Perron and moose at the course. “I was driving down the fairway one morning when a mom and two calves came out of the river,” he said. The moose took exception to the moving golf cart. “I had to call on the radio to tell people I was out of commission for a while as I was being chased by a moose.” Moose are fast but, Perron assured us, golf carts are more maneuverable. Newcomers to the course (undoubtedly newcomers to the area, as well) are thrilled about the moose populating the greens. One such newcomer shopping in the pro shop asked the late Jamie Packer, the club’s Canadian golf pro, “What time do you let the moose out?” Packer, never one to disappoint a customer, shouted the woman’s question over to Perron. “I told them I would go out and do it ‘right now,’” Perron said.